Make sure to register for the 2018 Iron Archer. This event is an Arizona Archer favorite. This year’s event is being run under different rules. As long as participation levels allow, the Flights will be separated by Compound and Recurve. Make sure to visit the Iron Archer webpage for information and registration links. 2018 Copper Classic Indoor hosted by 3G Archery. What: 30 Arrow ranking round followed by “Match-Play” shootout. Registration is limited to 52 archers. 40cm 10 ring or triangle 3-spot target scoring Outer 10 Recurve, Inner 10 Compound. Tiebreakers will be determined by 10’s,then 9’s. Senior: 21-49, & Masters 50+. be considered a bare-bow without sights and a compound if sights are added. Para Archers will be classified as equipment type, but accommodations will be made for lane placement if necessary. Short Lunch break… Soda’s, Water & Sports drinks will be for sale. Desert Sky Archers held the 2018 Summer Sizzle tournament this past weekend at the Ben Avery Indoor Range. This annual favorite was sold out with several archers on the wait list. The archery inside was just as Hot at the temperatures outside. Congratulations to all of the archers that competed! For results, click on the link below. 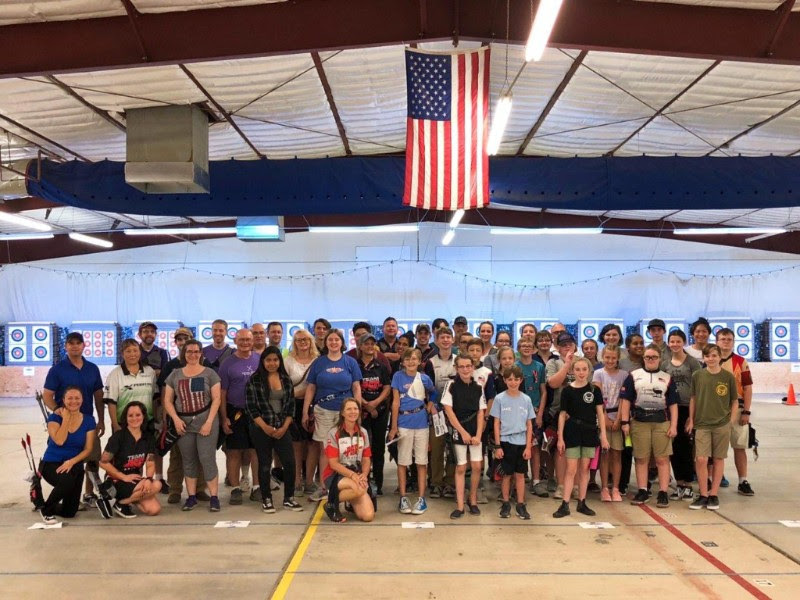 Story by AZ Board Member Kristy W.
“Many of our Arizona archers spent the past week in Raleigh, NC to compete in the 2018 JOAD Outdoor Nationals. All of the archers did a fantastic job representing AZ and made us proud! Congratulations to everyone on their performance and success and a huge shout out to those that returned with the title of NATIONAL CHAMPION!! Many of the best US JOAD archers are heading out to the 2018 JOAD Outdoor National Championships in Raleigh, NC. You can follow your favorite JOAD archer’s progress by using the Between Ends online scoring webpage. Below is a link to the Between Ends page. Registration has opened for the 2018 Arizona State Outdoor Championship. The event is being held at the Ben Avery Outdoor FITA archery range on September 29th-30th. For more information and a link to Online registration, please click on the link below. Registration for the Summer Sizzle has now opened. This years Summer Sizzle is being held at the Ben Avery Shooting Facility Archery/ Air Pistol Indoor Range on August 4-5, 2018. Recurve Bow and Barebow – 2 – 600 rounds, one from 25 meters, one from 18 meters; 25 Meters will have a choice of 60cm single spot or vertical. 18 Meters will have a choice of 40cm single spot or vertical. Must shoot same type of target at both distances. Outer 10 scoring on both distances. For a full description of the event, and a link to Online Registration click on the link below. 2018 May Mayhem, May 19 & 20. Desert Sky Archers have opened registration for the May Mayhem. This years event is being held on May 19-20, 2018 at the Ben Avery Archery/ Air Pistol Indoor Range. This years format is going to be a NFAA 5 spot round. For information about the event and a link to Online registration, please click on the link below. Papago Archery has opened registration for the Spring 900. This year’s event in being held on May 12th, 2018 at the Papago Archery Range. This annual tournament is the perfect “first time” tournament for archers. Please visit the Papago Archery website for details and links to online registration. A link to their website is below. USA Archery has opened registration for the 2018 JOAD Outdoor Nationals. This year’s event is on July 11-15 in Raleigh, North Carolina. You can visit the USA Archery Website for information and a link to registration. Below is a link to the USA Archery web page.